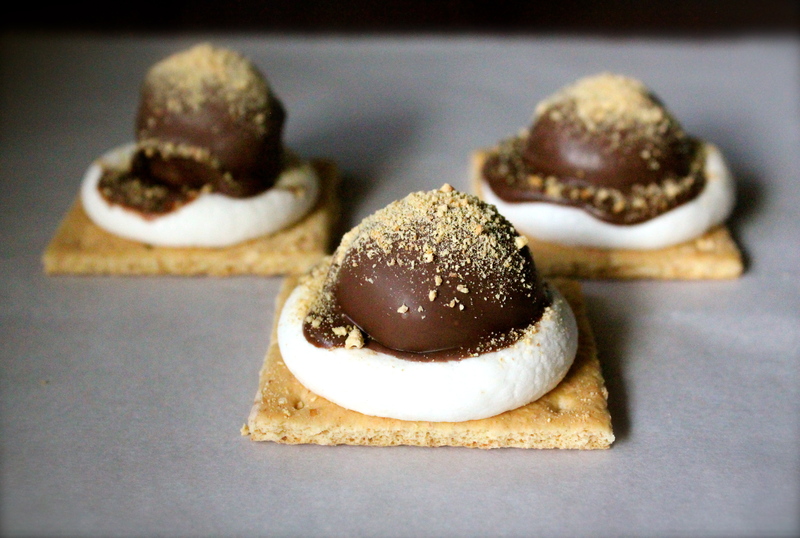 Happiness Project #30: S’mores Cookie Sliders! In two short days, my baby girl will be 9 months old! And although I’m fiercely excited about all of her developments (just yesterday, she tried repeatedly to pull herself over her baby gate! On top of the fact that she’s now standing, waving, high five-ing everyone she sees and has FOUR teeth already! ), it’s still very bittersweet to me as well. At nearly nine months already, her babyhood is fast coming to an end, and because she is my only child (unless we’re able to adopt one day), I can’t help but want to slow it all down. Wishful thinking, I know, but prevalent, none-the-less. *sigh* Oh, the beautiful, happy joys of babyhood! What a wonderous thing to witness! Mommyhood aside, a couple of months back, one of my cousins pinned a drool-worthy S’mores dessert on Pinterest (Oh, Pinterest!) and ever since then, I’ve been dying to create my own modernized party version of it! Hence these perfectly messy cookie sliders! The best part about this new recipe though, besides it’s triple chocolate yumminess? It’s quite easy to assemble as well as very family friendly! AND there’s NO baking required! You just have to be rather quick at multitasking! Seriously quick! Or else and better yet, this is one of those rare assembly recipes that the whole family can help out with! So grab a family member or two, throw on some holiday music and get messy with this delicious S’mores treat! Ready? Next, line a baking sheet with either a Silpat mat or parchment paper and fill up the entire baking sheet with evenly spaced chocolate dough balls. Place the baking sheet with the chocolate dough balls in the freezer for 20-30 minutes to chill. On a large microwavable plate, place 1 marshmallow on top of each halved graham cracker. Set them all aside. 2-3 minutes before you’re ready to take the chilled chocolate dough balls out of the freezer, empty the entire 12 oz package of chocolate candy melts into a medium sized microwavable bowl. Heat up the candy melts, in three to four 20 second intervals until the chocolate candy is completely melted and smooth. Set aside. Ready to take out those chilled cookie balls? Please do! Before you start dipping away though, you’ll need to soften the marshmallows you’ve assembled on their graham crackers. Softening them will create the cushion (or slight indentation) that the dipped cookie balls will sit on. Depending on the strength of your microwave, warm up each marshmallow until they are ever so slightly softened (my microwave was set at 14 seconds). Just enough so that you can gently press your finger down into the center of each marshmallow to create a slight cushion (or indentation). Now, the messy part! With a large slotted spoon, dip a cookie ball into the melted chocolate until the ball is throughly coated. *Oh, and just in case I didn’t mention it before, you might want to wear an apron for this! This can get very messy! * With the tip of the spoon, gently tap off the excess dipping chocolate (if you want a smoother cookie texture). Gently and carefully, transfer the coated cookie onto the cushioned marshmallow. Repeat for the rest of the cookie dough balls. Once all of your S’mores Cookie Sliders are fully assembled, stick them, covered, in the fridge until serving. See? What did I tell you? Fun AND easy! A perfect treat for all of those holiday family gatherings! So get to it and get messy! Nom! Nom! « Happiness Project #29: Peanut Butter Oatmeal Surprise Cookies!